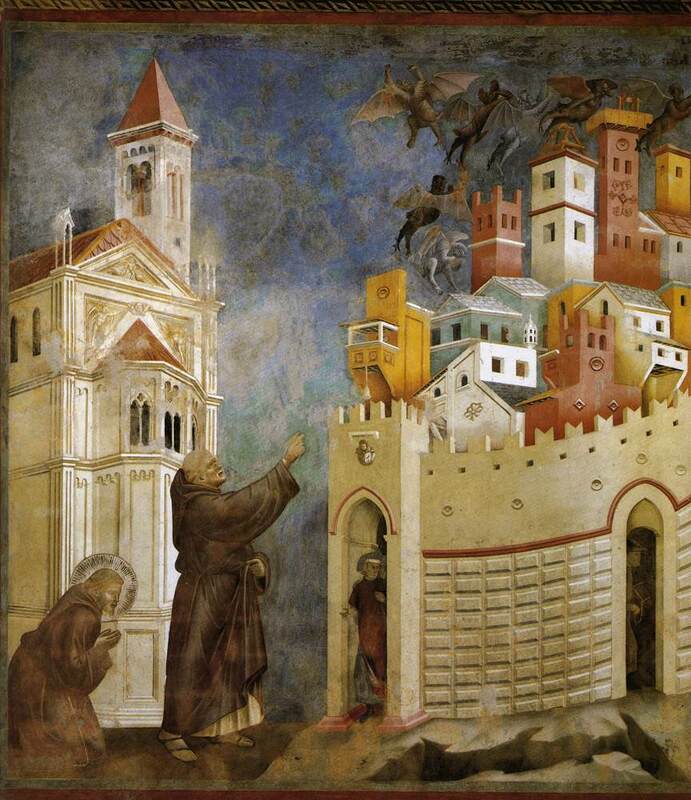 Giotto, Exorcism of the Demons at Arezzo (1299), fresco, 270 x 230 cm, San Francesco, Upper Church, Assisi, Italy. WikiArt. Every time that we sketch, draw or paint, we accomplish the small miracle of depicting a three-dimensional motif on our two-dimensional ground. Before widespread exposure to images created by optical instruments, notably the camera, most people saw very few 2D representations of 3D motifs, unless they were privileged enough to live in a house with paintings. For many their only opportunity was in church, if there had been no puritannical purge to remove imagery from places of worship. Even when printed images became popular, from the sixteenth century onwards, for many they remained sporadic treats. For the last century or two, pictures, photographs, movies, and now even 3D movies have become so commonplace that in the West it is hard to escape them. Even when far from human habitation you only have to pull out a book, smartphone, or tablet to gaze again at images, still or moving. The overwhelming majority of these have either been created by cameras or other optical devices, or (when computer generated) in accordance with geometrical rules which model the optics of cameras. As with my series of articles on colour, rather than trotting out a summary of the geometric transformations which would map the 3D world onto a 2D surface, I want to approach the subject from what we know about human perception. When drawing or painting realistically, our aim is to produce a 2D image which, when viewed by another human, creates in their mind what we perceived of the motif at the time of drawing or sketching. Although physiological optics, how the retina works, and how we can create a 3D model of the world from the images captured by a pair of eyes, are all very interesting, they are not immediately relevant. The most basic and fundamental aspect of the perception of space in any image is that of depth in the third dimension, in the case of a drawing or painting the ‘front to back’ axis which is lost when transferring the motif from 3D to 2D. Away from the geometrical regularity of human constructions, 7 (linear perspective) is usually almost absent, as there are few or no straight lines which are seen as converging to a vanishing point. Even where it is portrayed in a geometrically incorrect manner, as did Giotto, painting well before Brunelleschi ‘discovered’ linear perspective in the early fifteenth century, the result may look a little wonky, but we still get a good impression of depth and space. 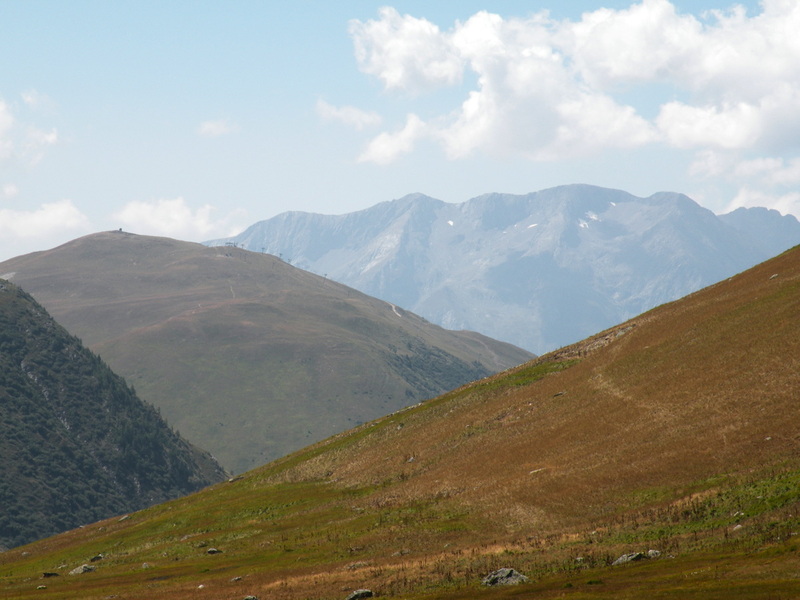 Travel out of town to the areas in which most landscape painting is done, particularly hilly or mountainous areas which are ‘scenic’, and there are almost no linear edges which can be seen converging to vanishing points. Even when armed with a photograph and a good imagination, it is very difficult to perform any sort of geometrical construction which might allow you to estimate the location of vanishing points. In open views, where distant objects may be many miles away rather than a few hundred yards/metres, 6 (aerial perspective) becomes of much greater importance. Aerial perspective captured on camera: mountains near Alpe d’Huez in the French Alps. EHN & DIJ Oakley. There are many illusions associated with spatial perception, but unlike with colour most do not give any deep insights into how we perceive space. Several do make an important point, that just as we have limited colour constancy, so there is perceptual constancy in which a square or cube appears square or cube even when the point of view makes it look quite different in shape. Conversely we may perceive something as a square or cube when it is not, but the cues we obtain from its appearance lead us to think that it is square or cube. Similarly we are very used to texture gradients being important cues to depth. If it happens that an area appears to have constant texture despite actually becoming more distant, that will work against the perception of depth. Although this rarely happens in nature, it is not uncommonly generated when a deep passage in a painting is constructed using visible brush strokes or other facture which we can see, and its texture remains constant through depth. 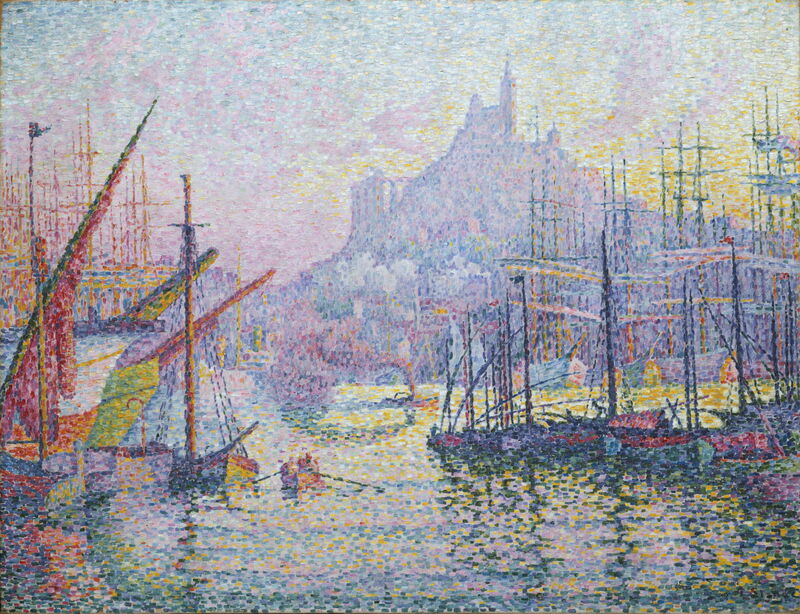 This has been recognised as a problem with Cézanne’s ‘constructive stroke’, probably being the most important factor in causing many viewers to see his later works as being very flat, and was corrected in Signac’s Divisionist technique. In my list above, I have put depth order, and the visual phenomena which allow us to construct that order, in first place because of its importance. In fact it is often omitted from such lists because it is so everyday and so simple that it is taken for granted. Until the twentieth century, when the more that some painters could violate the greater the adulation and value that they acquired, depth order was one of the most fundamental and inviolate principles of depicting a 3D image. 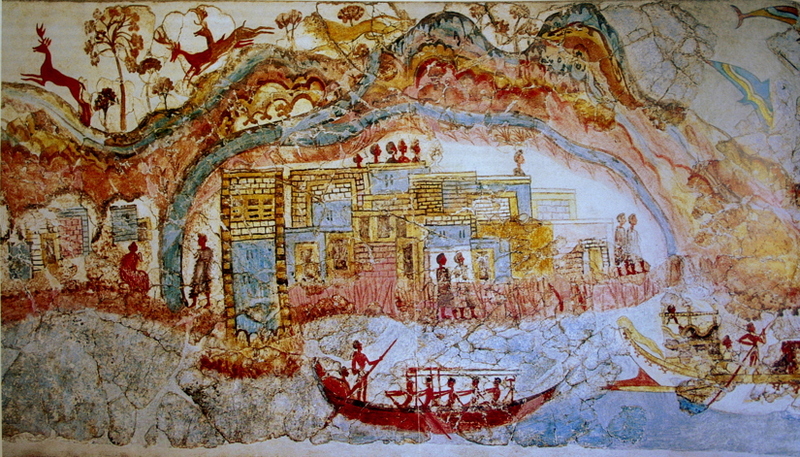 Anonymous, Flotilla Fresco (detail) (before c 1627 BC), fresco, Thera (Santorini, Greece). By pano by smial; modified by Luxo, Wikimedia Commons. Depth order is apparent in the earliest complex Western paintings, from the Aegean civilisations of before 1627 BC, although from time to time, when paintings contained more symbolic collections than representations of reality, all sense of spatial arrangement could become lost. Prior to the twentieth century, a serious and professional painter who violated depth order would only do so as a result of the most careless error. If your painting shows a man standing in front of a building, then every part of that man which was visible would be superimposed on the building, and occlude it locally. If part of the door, for instance, was shown as occluding the man’s leg, then that would violate depth order and would be assumed to be an error. Such errors are extremely rare, and usually hidden away in detail which the painter must have overlooked. However certain types of passage are more likely to result in error: one example is the depiction of reflections on water. 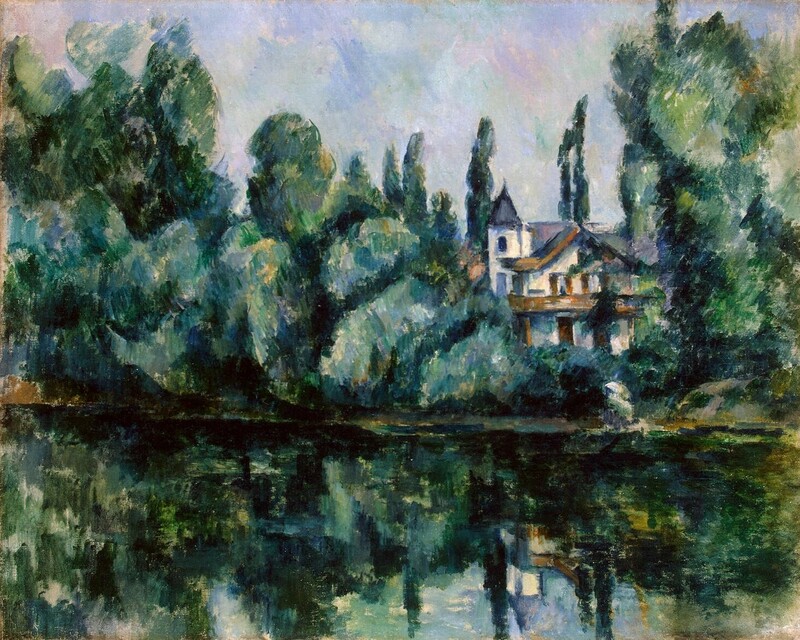 Cézanne violated depth order on more than one occasion when painting reflections. In his Bords de la Marne I (l’Île Machefer à Saint-Maur-des-Fossés) of 1888-94 (Rewald number 623, the Hermitage version), the original image of the house and its tower shows poplar trees distinctly behind it. However if you study the depiction of the same objects in reflection, the trees move forward in depth order and appear in front of both the tower and the house. I am not aware that anyone else has noticed or interpreted this very rare apparent violation of depth order. Paul Cézanne, Bords de la Marne I (l’Île Machefer à Saint- Maur-des-Fossés) (1888-94) R623, oil on canvas, 65 x 81 cm, Hermitage Museum, St Petersburg. WikiArt. Unless the painter depicts depth order correctly, any attempt to portray space in their 2D representation will be doomed to failure. Thankfully it is just a matter of careful observation, and accurate drawing. Bruce MacEvoy’s Handprint site is as ever a thorough account, particularly of linear perspective, and recognises its limitations. Ruben Meintema’s paper on spatial representation in video games here makes interesting reading, and is very cogent if rapidly outdating with virtual reality. Posted in Painting and tagged 2D, 3D, Cézanne, depth cues, depth order, Giotto, painting, perception, perspective, visual space. Bookmark the permalink.